Magic:Master Archer: Sagittarius, living up to the theme of his constellation, employs bow and arrows in battle, with his skills as a Celestial Spirit lying in their use. He has proven himself to be an extremely proficient archer destroying small objects which manoeuvre at high speed in mid air, with his arrows, demonstrating both pinpoint accuracy and great speed. He is able to notch and shoot more than one arrow at the same time. He also seems to be very resourceful with his archery, able to create fire by shooting electrical equipment. 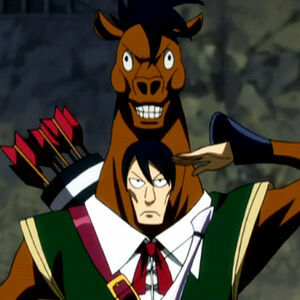 Appearance:Sagittarius, despite how people usually view him, is a tall, black-haired, lanky man wearing a horse costume. He has rustic, almost medieval style clothing. He carries a giant bow and has a giant quiver on his back. Personality: Sagittarius is very formal and respectful to his owner. He carries out his orders quickly, and always does what is in his capabilities. He also seems to take all of his requests literally, leading him to misinterpret certain orders. He has a habit of uttering the phrase "moshi moshi", which literally means "hello".